Robbie Neilson watched his Dundee United side continue their recent resurgence then stressed the importance of turning Tannadice into a fortress. Pavol Safranko’s second minute opener allied to Queen of the South defender Michael Doyle’s late own goal helped move the Tayside club to seven behind league leaders Ayr United in their quest for a return to the Premiership. This was United’s first league win on home soil since sweeping past Partick Thistle 3-1 back in late August which was a point not lost on their manager. “It was an important victory,” reflected Neilson. “We want to build on this and get fans coming back here so it’s a fortress. United got off to a whirlwind start. Fraser Aird’s deep cross caught out the visiting defence and Safranko was on hand to loop a header over Allan Martin. 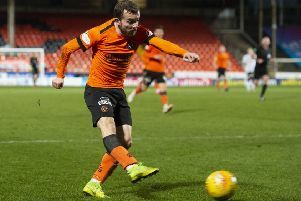 They needed a second to make sure, and in 81 minutes they sealed matters when Stewart Murdoch knocked a ball forward and Doyle turned the ball past the advancing Martin.